It looks a bit grim, so I'm only interested in Hayley's contribution. Missing letters out is one thing, but it now seems they are missing whole words out! "The Stolen" on its own doesn't make sense. So is it a misspelling of stollen or stole was my point! I agree, I don't much like the sound of this film. Or perhaps I WILL like the sound of it, if Hayley is singing, but probably not the story. Hi Martin, Richard, Libby and all! The film title is probably an allusion to The Stolen Generations, the Australian Aboriginal children who were systematically removed from their families and taken into state or church missionary care in the 20th. Century, especially but not only the first half of the century. I think it could turn out to be a very moving film and I am looking forward to seeing it, especially if as we think, Hayley sings in it! Well, Dave, while the IMDB page for the movie has changed many times over all the time it's been listed, Hayley's name is one of the only things that has remained the same! Of course, I think it's been about 4 years since Emily tweeted about meeting with Hayley (and Sophie) about this movie score. Here's a new tweet about the festival and photo from the movie! Notice what it says below the title. I'm wondering how those of us in the US will be able to see this. And I found this one by the movie's composer! No signs of anyone special at this event. I really can't find anything on it. Only can find the one in Berlin. Here's a website with some stills from the movie! Also, the plot synopsis, which goes into more detail than IMDB. No trailer, as the website suggests, but I wonder if there will be whenever the trailer is released. She will fight to the death for what she loves. Emily's headed to the Berlinale, but I have no idea how to find anything on anything other than the actual Berlin one. In other NZ filming news... Oprah and Reese Witherspoon are in Queenstown to shoot A Wrinkle in Time!! Hey, maybe Hayley will encounter them! It looks like it's being filmed in California, too. 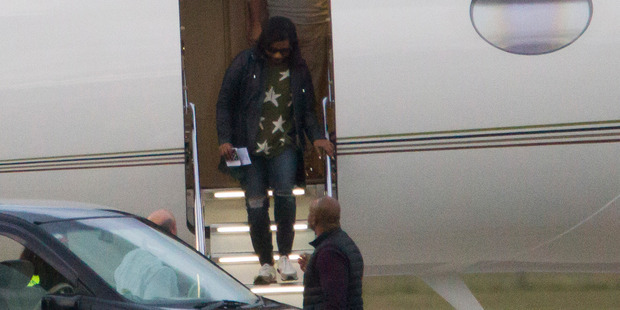 Hollywood stars Oprah Winfrey and Reese Witherspoon have been spotted in Queenstown as the pair arrive in the country to shoot a new film. The former talk show host and Hollywood actress will be filming A Wrinkle In Time alongside Mindy Kaling and Chris Pine. Kaling, star of The Mindy Project, was also spotted getting off the plane. Production is expected to take place in New Zealand during the next few weeks. The film is based on the best-selling sci-fi fantasy novel by Madeleine L'Engle. A day ago Witherspoon, who has starred in box office hits Walk the Line, Legally Blonde, and Wild, posted on Instagram ahead of her first visit to Aotearoa. I really want to see The Stolen now, after seeing those stills! The costuming looks great and the scenery looks gorgeous! I really want to see The Stolen now, after sEwing those stills! The costuming looks great and the scenery looks gorgeous! Yeah, me too! I do enjoy Western type shows/films. I won't watch many movies, but (besides fantasy/sci-fi) if there's any sort of movie on like this, I'll always try it, and usually I get into the story. Cowboys vs. Aliens was actually way better than it sounds (it sounds ridiculous, but it was pretty good). I guess that counts as sci-fi! I didn't like that mini-series called Into the West though, I found it too slow, confusing, and depressing. I grew up watching Little House on the Prairie and Dr. Quinn Medicine Woman, and also for books, I tend to go for historical fiction involving women in the west, or sometimes in high society in New York. LOL Usually the late 19th century stuff...which the Stolen kind of is; seeing a NZ story from this time period is very interesting. You never learn about the gold rush in NZ if you're not from there, that's for sure. Also, I don't mind a bit of "grimness" either. It's adventure and conflict, which is what makes a story interesting. Anyway, back to wondering when and how those outside NZ and the UK will see this. Looks like a trailer is coming soon. Thanks, Richard! I missed a few days on the forum, and completely missed that! Though I did think recently that I should check Emily's twitter page, without having seen this until I was about to post what I found today. I decided to use the FB posts instead, though. It's odd that she didn't announce the November release on her twitter page, too, otherwise I would have seen it the last times I checked. From a reply to someone on FB, it looks like it'll be early November. I don't think that's what "Honey" wears in the movie. LOL I don't think she's that wealthy. Thanks for inviting me to like the movie's Facebook page. Done! I've sent you an invitation in return!